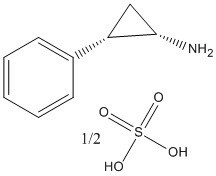 Tranylcypromine Hemisulfate | CAS# 13492-01-8 | 1816 | BioVision, Inc.
An inhibitor of monoamine oxidase (MAO) and prostacyclin synthase. Potently suppresses the enzymatic activity of Lysine-Specific Demethylase 1 (LSD1) (IC₅₀ <2 µM for BHC110/LSD1). When combined with GSK-3 Inhibitor CHIR99021 (Cat. No. 1677-5, 25), causes reprogramming of human primary keratinocyte transduced with two factors, Oct4 and Klf4.